...or why anybody would cut a perfectly good kayak into three pieces! Plywood? A sea kayak made from 4 mm plywood? Is that a really good idea? I stood in front of this little booth at the 1999 spring fair in Halifax. My face must have given my skeptical thoughts away. ‘Volkskayak’-Gerry Gladwin had a gleaming smile on his face when he told me all about his Greenland-inspired kayak design, a stitch and glue boat building method, and his workshop where you can build one. That day I had no idea that ten months later I would be building my own Volkskayak. During that summer I did a lot of sea kayaking with one of the local outfitters, and got hooked. By the end of the summer I decided that I had to have my own boat. Facing the problem of storing a sea kayak in my apartment, I remembered Gerry and his Volkskayaks. One particular design, the ‘Volkskomponentkayak’, could be the solution for my storage problem. This design, which breaks down into three pieces, would fit in an elevator and in the tiny storage room of my apartment. One important question remained. Familair with rotomolded seakayaks, I was curious how the hard-chined Volkskayak would feel and handle. Would I like it? Could I handle a kayak without a rudder? I gave Gerry a call, arranged a test paddle, and a week later I signed up for one of his workshops. I started building my kayak in November, restricted to weekends, and it took me two months to finish the project. The first weekend I stitched the six plywood panels of the hull and deck together with wire, then glued them with thickened epoxy. After only a couple of hours the result already gave an impression of the kayak. The following weekend I removed the wires, taped the seams with fiberglass tape, coated the wood with epoxy resin, and reinforced the two bottom panels on the outside with fiberglass cloth. After the deck and hull were joined, my Volkskayak was almost ready to paddle. But my boat was designated to become a Volkskomponentkayak. In preparation for this step we had done a modification during the previous steps. We used beefier 8 mm plywood for the bulkheads, and doubled them. Apart from glassing in the doubled, heavier bulkheads the kayak was then built like a normal stitch and glue kayak. Gerry handled the saw as I was too afraid to mess this part up. 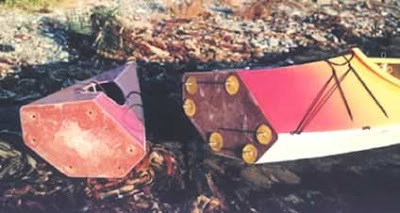 The saw blade had to hit right between the doubled bulkheads to separate the bow, cockpit, and stern sections. The operation was a full success, and the Volkskayak was transformed into a Volkskomponentkayak. 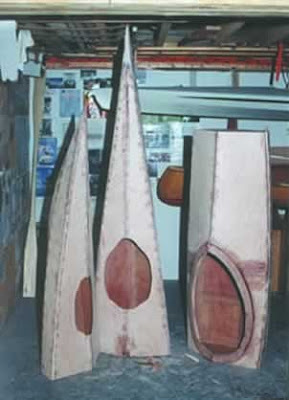 For paddling, the three compartments are bolted together with six bolts each through the bow and stern bulkheads. If I didn’t like it for paddling, I would at least have three pieces of unique furniture for my apartment! The next two weekends I glassed the outside of the bulkheads and did a lot of sanding and finishing. After Christmas I had my boat painted and was ready to go. 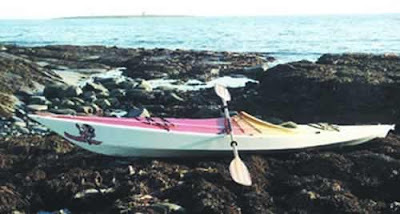 I launched it in the Northwest Arm of Halifax harbour and since that day I have covered a couple of hundred kilometres in my Volkskayak, exploring the lakes, coastline and islands of Nova Scotia, ‘Canada’s Ocean Playground’ on the east coast. And if I have to move to a new paddling place somewhere else in this world, my Volkskomponentkayak will be with me. The first one became airborne last spring, when Gerry checked it in as his luggage for a trip to Mexico.